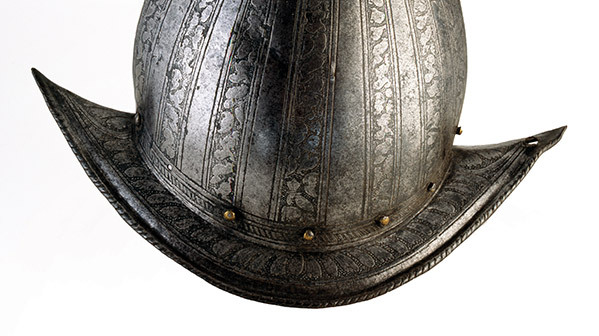 The exact provenance of this morion—a helmet without a protective visor or beaver—is not clear. It was almost certainly made in Italy around 1580, and it reached Ireland as a result of efforts by the papacy or Spain to support Catholic rebellions. The disastrous landing at Ard na Caithne, or Smerwick, in Co. Kerry, that year, when mercenary troops funded by the papacy were executed after they had surrendered, was a prelude to a much more profound challenge to Tudor rule in Ireland. The Nine Years War of 1594 to 1603 was, for both sides, an existential struggle. The galvanising figure on the Irish side was Hugh O’Neill, second earl of Tyrone and, after 1595, a proclaimed traitor. Raised in English manners in the Pale, he later modernised the methods of raising, equipping and funding an Ulster fighting force, which he trained to stand firm and fight in an open field. He also fused religion and politics into a powerful ideology. Previous Irish rebellions had appealed to a broad antipathy to England and Protestantism. In 1579, James Fitzmaurice Fitzgerald returned from continental military service bearing a papal indulgence for his followers and declaring a holy war against Elizabeth I, who had been excommunicated seven years previously. O’Neill, however, brought the idea of a specifically Catholic revolt to its fullest expression. The alliance he sought was for ‘Christ’s Catholic religion’. As the prospects of military aid from Spain grew brighter, he adopted the language of a struggle for ‘the extirpation of heresy’. He gradually fused this religious war with an appeal for the ‘defence of the native soil’. O’Neill translated this embryonic Catholic nationalism into a political manifesto, envisaging an early version of home rule whereby the English could appoint a viceroy but all civil posts would be held by Irishmen. This political strategy was backed up with military muscle. O’Neill and his allies inflicted significant defeats on government forces notably at Clontibret, followed up with a stunning victory at the Yellow Ford in August 1598, smashing an army of 5,000 men under Sir Henry Bagenal. Despite these successes, O’Neill’s revolt was weakened by his failure to seduce or bully the Old English of the towns. Diplomatically, he was limited by the unwillingness of Pope Clement VIII to declare his cause to be a crusade. These problems meant that ultimate victory depended on support from Spain. It came on 21 September 1601, when 3,300 troops landed at Kinsale—far from O’Neill’s Ulster stronghold and a dreadful site on which to withstand a siege. The English lord deputy, Charles Blount, Lord Mountjoy, locked the Spanish into Kinsale, forcing O’Neill and his ally Hugh O’Donnell to undertake a long march south to relieve them. When battle was finally joined, on 3 January 1602, it lasted just two hours but delivered a blow from which the Gaelic aristocracy would never recover. Kinsale was an epic disaster. O’Donnell left for Spain and died within months; O’Neill retreated to Ulster and fought on for another fifteen months, but something had ended, and it was not just a war.